Research and development (R&D) spending estimates for Canadian higher education institutions in 2015/2016 was $13.2 billion, up 2.8% from 2014/2015. R&D activities are classified into two types of science: natural sciences and engineering, and social sciences, humanities and the arts. Natural sciences and engineering continued to account for more than three-quarters (76%) of higher education R&D expenditures in 2015/2016 at $10.1 billion, up 2.6% from 2014/2015. 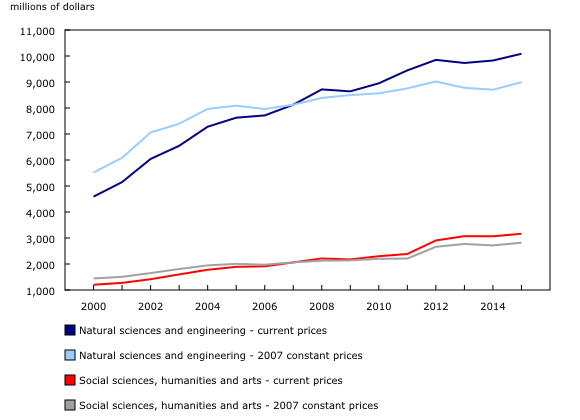 For social sciences, humanities and the arts, spending on R&D increased 3.2% to $3.2 billion. Since the year 2000, constant-dollar social science R&D expenditures have nearly doubled. All provinces showed increases in R&D spending in the higher education sector between 2014/2015 and 2015/2016. Ontario continued to hold the largest share of this sector's R&D (40%) with $5.4 billion in spending. Quebec remained the second largest contributor, accounting for a quarter of all higher education sector expenditures on R&D at $3.4 billion. Meanwhile, British Columbia ($1.5 billion) and Alberta ($1.4 billion) each accounted for approximately 10% of total spending. Sources of funding for R&D in the higher education sector rose in all sectors in 2015/2016, except for provincial governments, whose funding declined for a third consecutive year, to $1.1 billion. Meanwhile, the higher education sector itself accounted for $6.7 billion in funding, or half of total R&D spending. This share is not unprecedented: in 2000/2001, half of total higher education sector R&D spending was also sourced from within the sector. Historically, the higher education sector has contributed the most to spending on R&D in this sector based on the methodology employed in Canada, which allocates general university funds to the higher education sector. General university funds encompass funding instruments, such as grants obtained from various levels of government. The higher education sector is composed of universities and affiliated research hospitals, experimental stations and clinics. 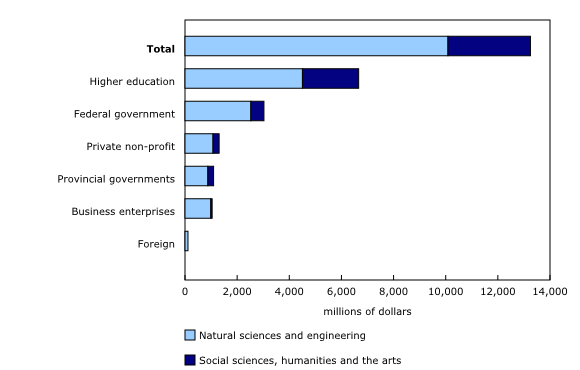 Total expenditures on research and development (R&D) are classified into two fields of science: natural sciences and engineering, and social sciences, humanities and the arts. There are six funding sources for R&D expenditures in the higher education sector: business enterprises, private non-profit organizations, the federal government, provincial governments, the foreign sector, and internal funding from the higher education sector. For further information on concepts and definitions relating to expenditures on R&D in the higher education sector, click on the Related information tab of this release.